​Below are news articles from the latest newsletter (December 2017). If you need the newsletter in its entirety, please contact Newsletter Editor Teri Wilson. Program: Bobbie Strobhar, Conductor of Harp Ensemble. See Luncheon page for details. Hospitality Committee: Tea Cookies by Money Management and College Women's Investment Club. Tea Table Decor: Jean Mahan; Pouring coffee / tea: Marjorie MacKeown and Marjorie Weeks. Cookie bakers: Barb Laake, Margie Newman, Anne Pepiot, Jean Short, Peggy Beavin, Martha Bell, Ruth Hoecker, Jeannine Phlipot, Rhonda Barner, Terrie Koss, Karen Weglage. Please remember to make your checks payable to The College Women’s Club (CWC) by Monday, November 27. There is so much we can say about the month of December. It is a month when passion for humanity is heightened; there is ex-ponential gift giving, gobs of holiday and family celebrations. Many people like to participate in global travel from Mexico to Malta or northern lights to sunny skies. Listed as some of the best travel destinations during this festive season are Nuremburg, Prague, Cologne, Tallinn, Budapest, Vienna, Dresden and Lucerne. Several of our CWC members fall into the category of "world travelers" and perhaps some of them have already made plans to visit one of these locations for the holidays. There are also three additional trivia facts about the month of December that you may find interesting. December starts on the same day of the week as September every year and ends on the same day as April every year. “International Free Hugs Day” is celebrated on December 4th. Give all your loved ones a hug! The hugs are meant to be a random act of kindness, a selfless act performed just to make others feel better. Reflections on the previous eleven months automatically consume our psyche such as "What could I have done better? ", "Why haven't I completed this project?" etc, etc. As always we find a compartment for those thoughts, store them there and go back to our Christmas shopping or just shopping in general. It is so funny that we always remember what we buy during the Christmas holiday better than any other time of the year. I cannot leave this letter without commenting on the Christian religious aspects of December. Our hearts and minds focus on the Gregorian calendar date of December 25th. The Gregorian calendar is internationally the most widely used civil calendar. It is named after Pope Gregory XIII who introduced it in October 1582. As historians, we know that factually Christ was not born on this date but what we are celebrating is the grace and mercy his birth brought to this world in which I am thankful. The Christian communities instruct us to "Keep Christ in Christmas". I think that we should include grace and mercy in all of our days. Rest in your blessings this month, enjoy this wonderful time of the year and think of something that you can give to others. ​CWC Board Meeting: The board meeting will be held on December 2 at 10:30 a.m. at the Dayton Woman's Club. NOTE about Yearbooks: Judy Holt is searching for yearbooks from past years to place in our CWC archives. Please contact Judy if you have any yearbooks to donate. Thank you! February Newsletter Deadline: Tuesday, October 3 to Teri Wilson by either email or snail mail or give it to Marianne Shoemaker at the October CWC meeting. Teri's contact information is in the yearbook. Scholarships: CWC Scholarships were given to four women this fall. Please see the newsletter for details. Sinclair student in early childhood education; mother of two young boys. Sinclair student in dietary education; hopes to transfer to Univ. of Dayton to become a Registered Dietitian; mother of four girls. Wright State student majoring in business management; goal is to open an animal therapy facility for children with a range of disabilities, injuries, and special needs; mother of one boy. Sinclair student taking prerequisite classes in nursing; plans to transfer to Univ. of Cincinnati's nursing program. Study Groups: Study Groups are monthly gatherings filled with laughter, talking, eating, debating and learning. These smaller groups provide a wonderful way to get to know each other better. Ask to visit the Study Groups of your choice and enhance the friendships that you’ve made at College Women’s Club. See your yearbook for details. Book Group — Leaders: Malou Hurst, Carolyn Nikolai. No meeting in December. Arts and Crafts Group — Leaders: Sandy Mefford, Linda Parker No meeting in December. Money Management Group --Leader: Marilyn Tolnitch. No meeting in December. College Women’s Investment Club (CWIC) -- Leader: Peggy Beavin. Book Review provided by Malou Hurst: “Skeletons” by Kate Wilhelm. Lee Done agrees to house-sit for her grandfather who is off to England. She has left university with three majors but no degree after four years. Her college roommate joins her after Lee hears noises in the night that produce no evidence. An empty bag that had held ice is found which leads to a night-time patrol in the woods, a dead body and the necessity of getting rid of it. Then the FBI shows up. The girls begin to search for what Grandfather must have hidden in his house. Secrets are discovered, must be explored, and lead to both danger and love! December 4. This form is primarily for permission for a picture in which you may appear to be published on our CWC website. If you have questions, please see or call Martha Shields. Click HERE for the form. 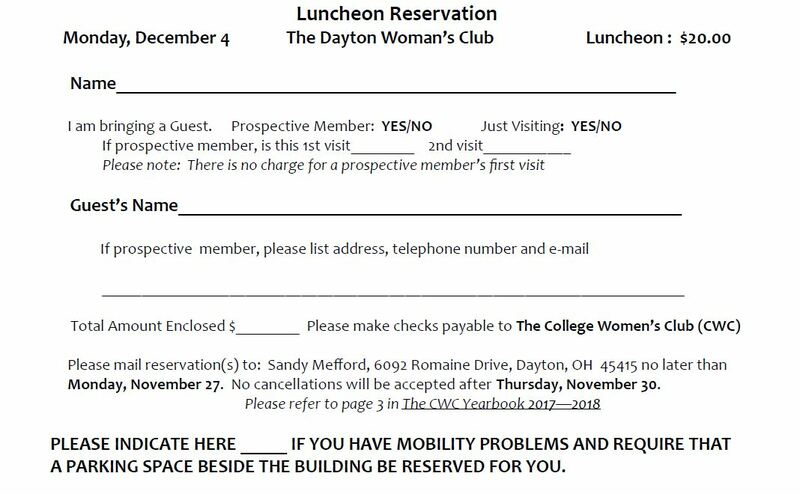 The Luncheon Reservation form for the CWC December 2017 Luncheon is provided below.